Adult male blue pondhawks (Erythemis) in the United States include the Western (E. collocata) and Eastern (E. simplicollis) Pondhawks. The species normally encountered, and often abundantly so, in Arizona is the Western Pondhawk, but there are a few isolated records also of Eastern Pondhawks (see under this species). There is continuing debate about the systematic relationships between the two species, as they may hybridize in regions where their distributions overlap and intermediates are found (e.g., Paulson 2009). Male Eastern and Western Pondhawks are usually separated based on appendage color (Western: black;Eastern: white; see figure below). Other, more subtle differences include abdomen shape (Western: tapered; Eastern: slightly constricted in the middle and swollen base) and adult eye color (Western: dark blue; Eastern: lighter blue with more apparent pseudopupils; Paulson 2009). 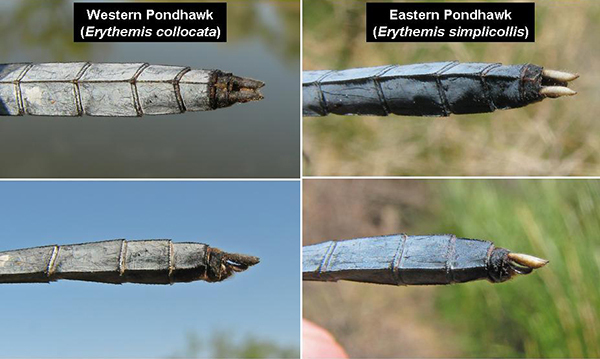 Dorsal and lateral views of the male Western and Eastern Pondhawks appendages, AZ.